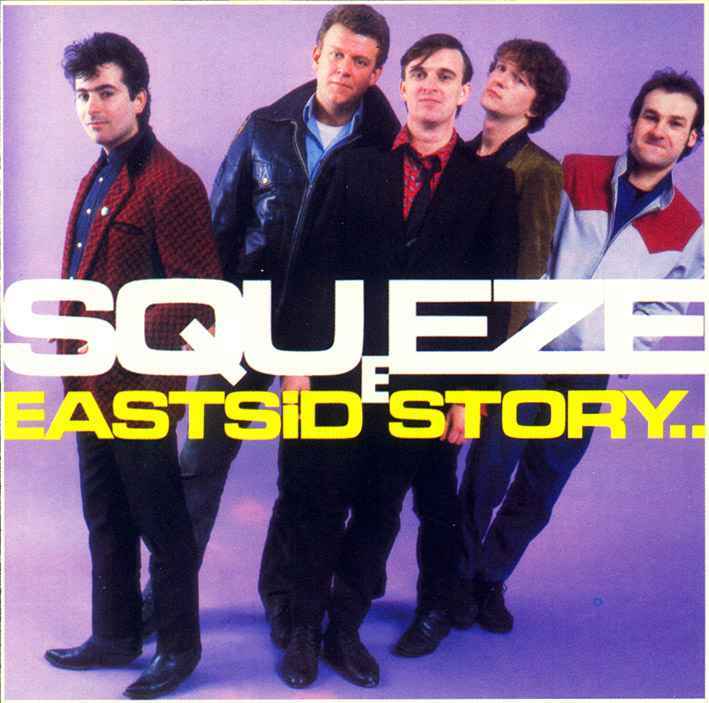 Discussions Magazine Music Blog: Why SQUEEZE's East Side Story is one of the greatest POP albums EVER! Why SQUEEZE's East Side Story is one of the greatest POP albums EVER! Back before Squeeze songwriters Glenn Tilbrook and Chris Difford were dubbed the 'new Lennon & McCartney" they were the quintessential British songwriting team. Difford's lyrics were always clever and Tilbrook knew his way around a melodic hook, thus making them more than just another Pub or New Wave band. While other groups would seize the moment and create music that was of it's time, not wanting to look too far back into Rock's rich history. Difford and Tilbrook were different - they embraced their influences without copying them. Before East Side Story, they released their first three albums (Squeeze, Cool For Cats and Arbybargy) to critical acclaim and managed to have a few hit singles in the process. But with East Side Story, they stripped away the production excesses and recorded an album that was simple, warm and filled to the brim with melodies that were sweet yet tough. This was the first album where critics started to make their 'new Lennon & McCartney' case, and deservedly so. With straight-forward production by the great Roger Bechirian and Elvis Costello (who really should have produced a lot more albums than he actually did), East Side Story is charming without being quaint. It's not an album of twee pop songs for the New Wave generation - its a mature slice of Pop/Rock that still sounds fresh and invigorating over 30 years later. Instead of recreating their breakthrough album Argybargy, Squeeze stepped up to the plate and delivered an album so full of life, love, heartache and joy that its difficult not to experience those emotions while listening to it. When East Side Story was released, I was 18 years old and had already experienced the highs and lows of every emotion related to a relationship. This was an album that opened my eyes to a passion that went beyond a love shared by two people. The songs spoke about things beyond the typical boy/girl fodder that Pop was known for. They were about real life, real feelings, real people. The songs were not about the same kinds of politics that The Clash and The Jam sang about.... these were more personal and close to home. It is an honest album that invites the listener into the band's world, which reflects what was going on around them at the time. In many ways, East Side Story reflected the lives of the listener: same situations, different characters. Ordinary lives, extraordinary songs. From the opening track, "In Quintessence" (the only song on the album produced by Dave Edmunds), the album is a thrill ride through a myriad of styles and moods. They remained a Pop band, through and through, but they took little detours along the way, building an album as diverse as it was melodic. The hit single "Tempted" (written by Difford/Tilbrook but chiefly sung by new keyboardist Paul Carrack) adds a little slice of Soul to the album while "Labelled With Love" is a Country weeper that sounds incredibly natural and not forced at all. "Messed Around" is a Rockabilly ditty that comes immediately after "Vanity Fair", which could have been a Revolver track had "Eleanor Rigby" not have existed at the time. The band's desire to experiment is evident in "There's No Tomorrow" and "F-Hole", both of which feature great melodies within musical frameworks that are entirely different to the rest of the album. As for the Pop side of the band, "Someone Else's Heart", "Is That Love? ", "Woman's World" and "Piccadilly" are absolutely perfect in every way... from the production to the performance. The only blemish on the album is the less-than-stellar "Heaven", which still fails to excite these ears over three decades later. So, you may be asking yourself HOW can this be a great album if there is a bad song on it? Well, most people think that Sgt. Pepper is one of Rock's greatest albums of all time, right? Well, I don't personally know many people who can sit through "Within You Without You" on that album... so I rest my case with that one example. East Side Story still feels fresh and certainly not of it's time. It is an absolute delight of an album that raised their profile in the Rock 'n' Roll community and made the band stand out in a sea of 'New Wave' bands (I use that term to define how they were categorized, not how they sounded). It is entirely unpretentious and is a virtual love letter to the glory, magic and power of Rock and Pop music. Unfortunately for Squeeze (and for all of us), Carrack left the band after touring for the album and the band began to lose momentum, commercially. When their follow-up album, Sweets From A Stranger, was released, the simplicity of the band was swallowed up by glossy production and they split after a further single. They've reunited since then a few times and while their albums have been fantastic, nothing has come close to the magic of East Side Story. Well, OK... maybe some albums did come pretty damn close, but not quite. Don't get me wrong... a mediocre Squeeze song is still loads better than most band's entire back catalog! But don't take my word for it... go buy the damn thing and listen for yourself!